Las Vegas, the Adult Disneyland! Although there are now lots of things for "families" to do, it is still very adult-oriented. 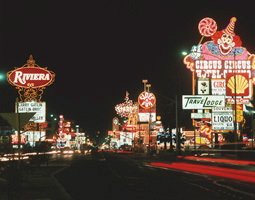 The big casinos are cities within themselves, with restaurants, shopping and recreation, but Cosmo.com has listed some of the better spots.